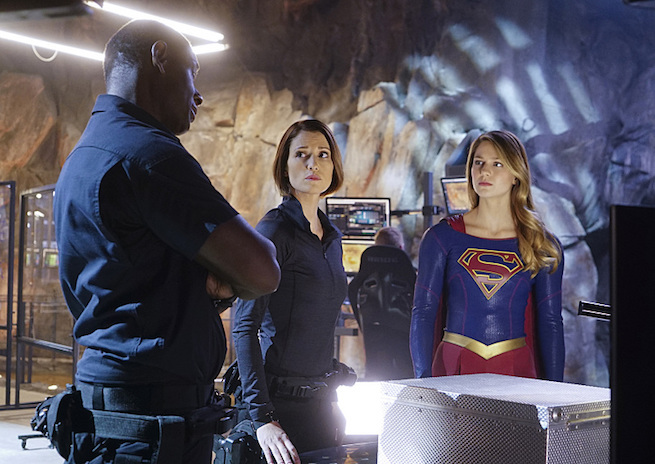 You can always expect a sometimes compelling, sometimes maddening hour of television when viewing an episode of 'Supergirl.' 'Bizarro' was way more balanced than usual offering a much more confident and complex chapter. Melissa Benoist once again, elevates Kara Danvers as a sympathetic and caring heroine. Bizarro, as dubbed by Cat, is Maxwell Lord's seventh comatose Jane Doe whose experiment finally took making her a Supergirl clone. She's a clean slate, corrupted by Lord to hate Supergirl, and made to look like Kara. There isn't much else to her character but some interesting ideas are explored as Lord's Frankenstein. The thought of a man controlling one woman to pit against another for his own means is reason enough to hate Lord but threatening to leak Alex's sister's identity as Supergirl to the world is potentially catastrophic. So dangerous that Alex throws out the Constitution and imprisons Lord at the DEO. It gives the usually staid Alex some gray area to work with that adds some character and shows she's not just a badass but willing to bend the rules too. Even though Bizarro proves to be a formidable adversary except the opposite sources of power, green kryptonite makes her stronger while blue eventually takes her down, Kara sees she's being used and behind the bullet-riddled face lies an innocent victim, a pawn in someone else's game. This is where Benoist shines emoting so much empathy and concern for her put-upon rival. And throughout, she exhibits truly honorable support even holding Bizarro's hand as she's induced back into a coma since her condition is irreversible. The fight sequences were pretty good but Supergirl's heart proves to be more effective. Speaking of the heart, Kara and Adam give dating a try but ultimately life as National City's guardian makes having a personal life difficult. And despite great chemistry and photogenic coupling, Kara breaks off any chance of a relationship to the chagrin of Cat who had been remarkably pleasant while the courtship of her son was in play. Now she makes it clear to keep it professional in the office in the wake of Adam's broken heart. The sudden romance between Kara and Adam helped with some emotional housekeeping between Winn and James. Winn came to terms with his permanent residency in the "friendzone" while also advising James to get his feelings straight about who he really cares about. He knows James is torn between Lucy and Kara. While in the clutches of Bizarro says the "L" word about Supergirl so I'm sure we'll be exploring that development going forward. 'Supergirl' is still going through some growing pains but with each episode there's some growth and Benoist is the anchor that keeps the show afloat with her dynamic acting range and endearing personality. She always finds the humanity within Supergirl while juggling a messy life as Kara Danvers. See the preview for the next episode, "For The Girl Who Has Everything."